Home News Reports Kapil Sibal acquired land in Delhi worth crores by paying just 1 lakh rupees? Acquisition of land or property by politicians at throwaway prices has been a recurrent theme in controversies or corruption cases we have witnessed. Congress President Rahul Gandhi and his mother Sonia Gandhi are themselves accused of acquiring properties at cheap prices in the National Herald scam. Similar accusations about land deals are pending against Sonia Gandhi’s son-in-law Robert Vadra and even Priyanka Gandhi Vadra has some controversies regarding land deals to her name. Now the latest addition to this illustrious list appears to be senior Congress leader and well-known lawyer Kapil Sibal, who has been reported to have acquired a piece of land valued at 89 crore rupees in the New Delhi municipal area by paying much less amount for acquiring the holding company. Kapil Sibal and his wife are believed to have bought 100% shares – both buying 50% shares each – in a company where they could have paid just one lakh rupees i.e. the paid-up capital of the company. The company – Grande Castello Private Limited – owns the land in Delhi that was valued at Rs 89 crores in the books of the company before the acquisition. This incident of owning a prime property by virtue of owning shares in the holding company is similar to the National Herald controversy. Some details about Sibal’s acquisition of the aforementioned company and his dealings with a businessman named Piyoosh Goyal were first published in January this year by some investigative journalists based in South Africa. These journalists were part of a publication named Daily Maverick and a non-profit initiative for investigative journalism named amaBhungane. Strangely this story did not make it to the mainstream Indian media, though some other reports by these South African journalists did (as we will see later). Incidentally, these journalists were investigating corruption charges against Jacob Zuma, the then President of South Africa who resigned in February this year after charges of massive fraud and impropriety. The charges against Zuma are similar to what Congress leaders and governments have faced back in India – crony capitalism, favouritism, nepotism, corruption, and misuse of power. Zuma was accused of being involved in various fraudulent deals benefitting his family with the help of Gupta brothers – India born influential South Africa based businessmen with interests in computers, media, mining, and real estate. Zuma’s son is reported to be a director in many companies of Gupta brothers, and thus Zuma was accused of granting undue favours to Gupta brothers as a result of which piling personal fortunes for himself and his family. For example, there was one instance where Bank of Baroda, through its South African operations, gave loan to Jacob Zuma’s fourth wife to buy a house. The loan was paid by companies owned by Gupta brothers. Helping Zuma’s wife pay a housing loan is lesser of the charges levelled against the Gupta brothers. There have been reports that Guptas were so influential and powerful in South Africa owing to their proximity to the Zuma family, that they even used to offer posts in the central government to politicians (fixing cabinet berths a la Radia tape controversy back in India) apart from winning government contracts for themselves. The South African journalists stumbled upon Kapil Sibal while investigating the deals by companies owned by Gupta brothers. The journalists focused on those business deals by the Guptas which they suspected to be attempts at money laundering. Among others, a company named ‘Worlds Window’ was alleged to have helped Guptas launder money in the range of tens of crores of rupees between 2010-2015. 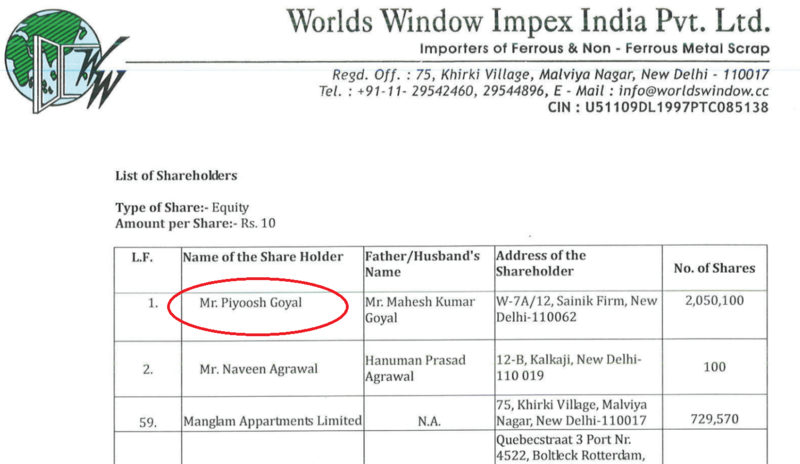 Piyoosh Goyal and Gupta brothers are reported to have begun their business relationship in 2010 and they appeared to enjoy good personal relations too. Daily Maverick amaBhungane claim that family of Kapil Sibal – the Congress leader, his wife Promila Sibal, and his son Akhil Sibal, who is also a lawyer – and families of Piyoosh Goyal and Gupta brothers took a chartered flight from Delhi to Mumbai to watch the final of the 2011 Cricket World Cup between India and Sri Lanka. The flight was booked by the staff of Gupta brothers, the South African publications say, further claiming that the Guptas had paid for Akhil Sibal and his wife to stay at the luxurious Queen Victoria Hotel at Cape Town’s V&A Waterfront over Christmas and New Year’s Eve later that year. When the journalists got in touch with Sibals over these two favours granted by Guptas, both the father and the son Sibal denied that they knew Guptas or had any business relationship with them. However, Sibals confirmed that they knew Piyoosh Goyal, whom Kapil Sibal referred to as a friend. Akhil Sibal too confirmed that he knew Goyal for several years and he (Goyal) was his client. Sibals claim that it was actually Goyal, whose hospitality they had accepted, both for the Delhi-Mumbai chartered flight and the Christmas holiday in Cape Town, however, the South African publications maintain that the money for both these events was paid by companies owned by the Guptas. 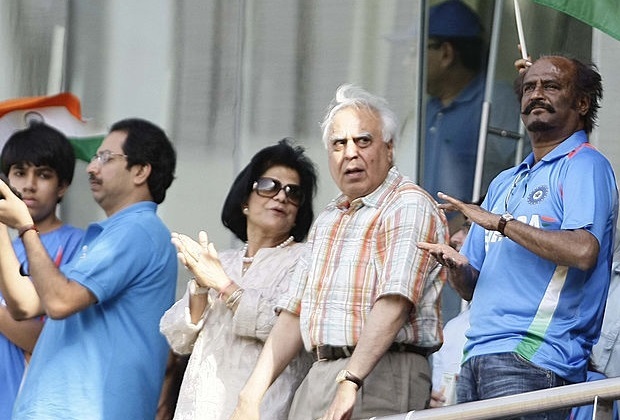 While Kapil Sibal referred to Piyoosh Goyal as his friend, documents show that they enjoy business relations too, which helped Sibal become the owner of a piece of Delhi land worth crores, possibly by paying just one lakh rupees. Documents show that as on 31st March 2017, Kapil Sibal and Promila Sibal owned 50% shares each in a company called Grande Castello Private Limited, which was a 100% subsidiary of Worlds Window Impex India Pvt. Ltd, the company controlled by Piyoosh Goyal and allegedly involved in money laundering for Guptas as per the South African publications. However, there is no direct link of Kapil Sibal with Worlds Window’s dealings with Guptas. 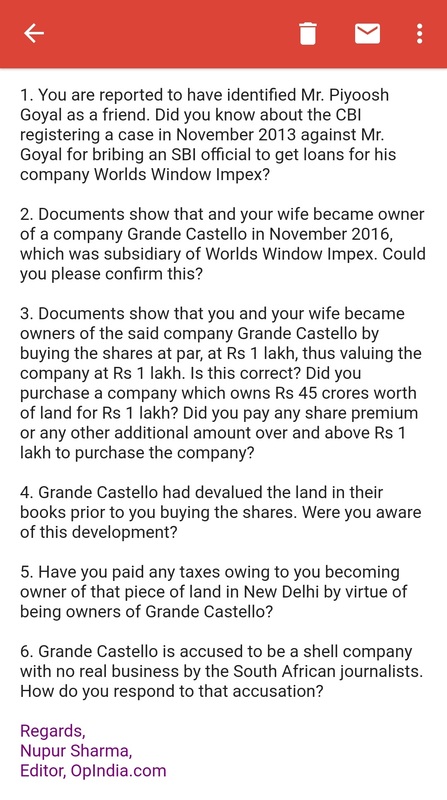 But Sibal’s dealing with Worlds Window for acquiring Grande Castello Private Limited and Grande Castello’s own dealings are a bit opaque. Grande Castello, with no business in Financial Year 2013-14, commenced purchase of a piece of land, which eventually cost Rs 45.21 crores. To fund, this, the company raised interest-free loans and book overdrafts. Incidentally, Kapil Sibal and his wife purchased the company in the very next year after this devaluation. As mentioned earlier, Sibal and his wife became the owner of the company by acquiring 100% of the shares, face value of which comes to 1 lakh rupees as the paid-up capital of the company. It is unclear as to at what value the shares were bought from Worlds Window – no publicly available document could confirm this – when the company owned valuable property in Delhi. Valuation of the company changed drastically within a couple of years in buyers’ favour before Sibals bought the shares. As can be seen, based on the company’s own assessment of the value of the land, the company is worth anywhere between Rs 33.52 cr to Rs 37.50 cr when Sibal took over the company. And this is based on the market value of the land in Financial Year 2014-2015, i.e. 2 years before Sibal came in. The value could have further appreciated in the 2 intermittent years. This also brings into focus: Why was the land devalued after revaluation just 1 year ago, just in time before Sibal came in? So that the net worth of the company goes below zero and acquisition of the company without paying any premium could be justified? These are some questions that needs explanation. Apart from his dealings with Gupta brothers that are alleged to be money laundering attempts, Piyoosh Goyal had run-ins with other controversies too. In November 2013, the Central Bureau of Investigation (CBI) registered a case involving bribe-for-loan against the then deputy managing director of State Bank of India (SBI) Shyamal Acharya and Piyoosh Goyal, who was accused of giving bribes to SBI officials to get a loan of Rs 400 crore disbursed in favour of Worlds Window group. CBI had seized cash, gold and other incriminating documents from the SBI MD’s residence, which presumably were used to pay bribes. In 2011-12, Everest Global Metals, a company controlled by Piyoosh Goyal, got a loan overdraft facility of Rs 8.2 crore from Bank of Baroda, but the monthly interests for that loan were paid by companies owned by Gupta brothers. A report by Hindustan Times published in February this year says that when Piyoosh Goyal’s Everest missed a payment in November 2012, a Bank of Baroda manager wrote directly to a director of several Gupta companies reminding him of the missed payment, hinting at the close association Piyoosh Goyal enjoyed with the tainted Guptas. Interestingly the aforementioned Hindustan Times report, which talks about Gupta brothers and Piyoosh Goyal, makes no mention of the incident involving Kapil Sibal, who reportedly termed Piyoosh Goyal as his friend to the South African publications. This omission by the Hindustan Times becomes pretty interesting given the fact that the Hindustan Times report mention both the South African publications – Daily Maverick and amaBhungane – as a source of information. Their report mentions about Piyoosh Goyal too, and his dealings with the Gupta brothers, but ignores Goyal’s dealings with Sibal, which was already written about by the two South African publications. Hindustan Times mention the two South African publications as their investigative journalism partners but ignore their reports on Kapil Sibal. Whether it was an inadvertent oversight or deliberate omission, only Hindustan Times can explain, however, it is nearly impossible to miss the Kapil Sibal part of the story after discovering about Piyoosh Goyal when your source of information is Daily Maverick and amaBhungane. 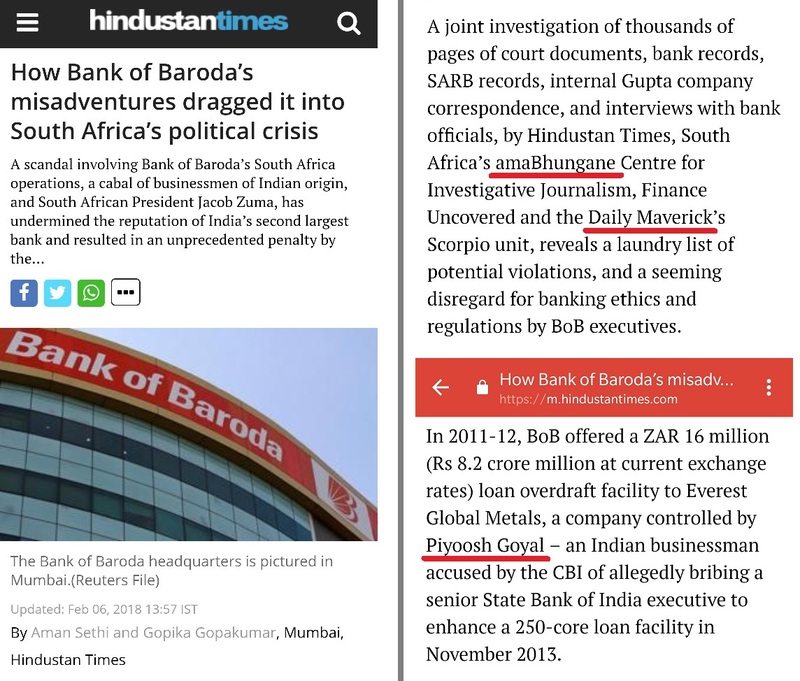 Even if one assumes that Hindustan Times decided to focus only on Bank of Baroda and their dealings with Gupta brothers in that particular report, it is indeed intriguing that they did not file a separate report on Kapil Sibal and his dealings with Piyoosh Goyal, something that would have been more relevant to the Indian readers. Daily Maverick and amaBhungane claim to have reached out to Kapil Sibal and asked him about his dealings with Piyoosh Goyal and acquisition of Grande Castello, which they suspect to be a shell company. However, Sibal was not cooperative or forthright with his answers. South African journalists then claim to have given him the documentary proof of him being the director, and in fact becoming the owner of the company in November 2016, further asking him about the unsecured loans in the account books of the company, but Sibal allegedly refused to correspond further accusing the journalists of having a “mischievous intent”. OpIndia.com too has reached out to Kapil Sibal and has asked him to clarify his position on his dealings with Piyoosh Goyal and him becoming the owner of a prime land in Delhi by paying possibly just 1 lakh rupees. We did not get any response by the time of publication of this report. We will update this article with his response if we receive it. Update: Kapil Sibal has threatened to sue us for alleged defamation in this article, here is our response.